* You may order less than the 6 piece minimum, but when doing so there is a $24.99 shipping and handling charge. Please call us at 1-800-419-1130 and we will be happy to assist you! Pay less per piece by ordering more pieces! If you would like to see how this crown molding looks on your ceiling you can order a 10" sample for only $3.00. By holding the sample up to your ceiling you can make sure the size and style are the perfect fit for your project. Polyurethane crown molding may be cut, nailed, and installed the same way as wood moldings. To assist you we have step by step instructions on How to Install Crown Molding. If you still need additional assistance don't hesitate to give us a call -- we are experienced at installing and are happy to help! To make the job easier you may also order Crown Molding Blocks that work with our small to medium size moldings or you may order Precut Molding Corners (recommended only for plain crown molding). To make your own corners read the article: How To Cut Crown Molding. 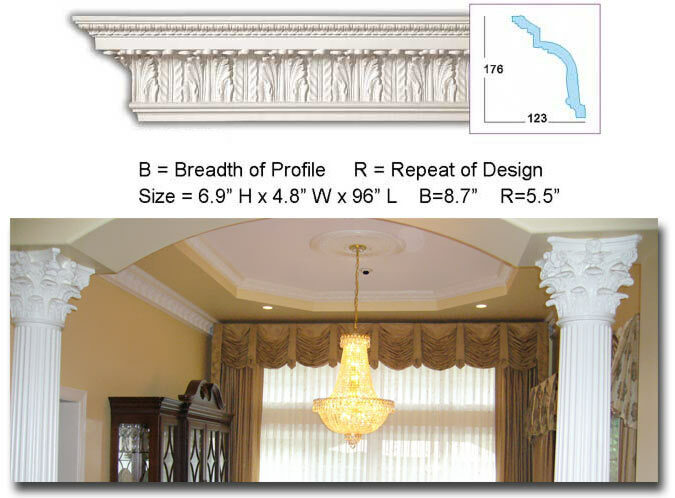 Crown Molding: What is Breadth, Height, and Width? 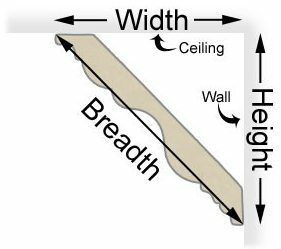 Breadth - the distance between the outer contact point with the ceiling to the bottom contact point with the wall (the hypotenuse of the right triangle whose legs are the width and the height). Height - the distance between the ceiling and the bottom contact point with the wall. Width - the distance between the wall and outer contact point with the ceiling. Tip: When planning for crown molding, inspect the walls and ceiling to see if any vents or other objects are within the footprint of the molding. There is a proportionally sized molding for just about every ceiling height. Choose your ceiling height above and you will be shown crowns that work best in your home. If you'd like to browse by molding size or style, look below and click on the size or style that you are interested in purchasing.